So this is a knock off recipe of the Footprints Flatbread from T-Rex only made with bacon instead of chicken. You see, back when Jason and I had first graduated college, we went to Disney and ate these really delicious meals. We cooked a lot before, but when we came home, we were unemployed job hunters with a bit more time on our hands than we had ever had before. That's when we started diving into recreating every recipe we could from our honeymoon, and this one is a true favorite. You could always replace the bacon with some chicken or leave it off completely - we have tried both and it's still amazing. 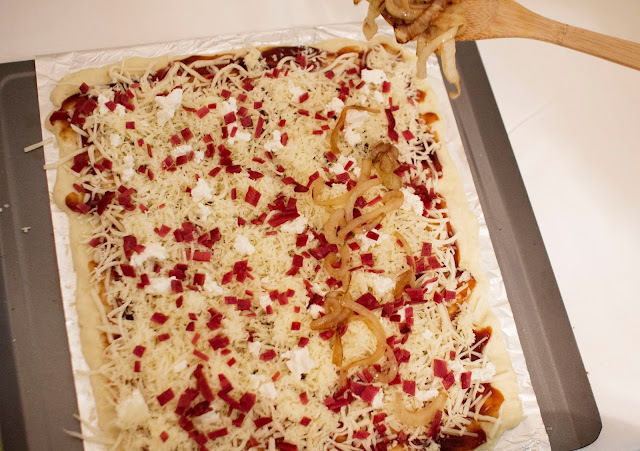 Before starting the pizza, prep your turkey bacon. Preheat the oven to 375 Degrees Fahrenheit. 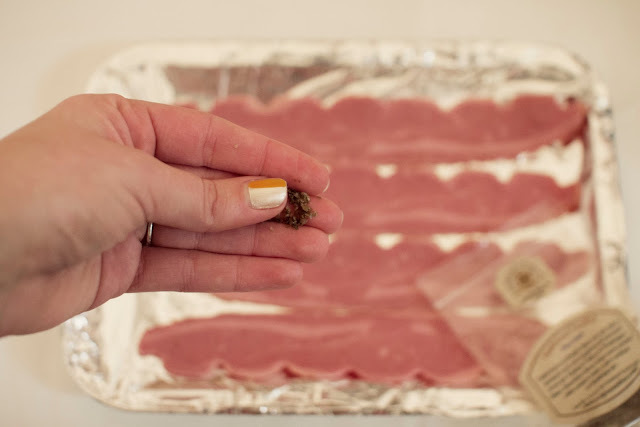 Lay out 4 pieces of turkey bacon (or real bacon, we prefer turkey though!) and sprinkle lightly with some seasoned salt. Place in the oven for 15 minutes or until crispy. 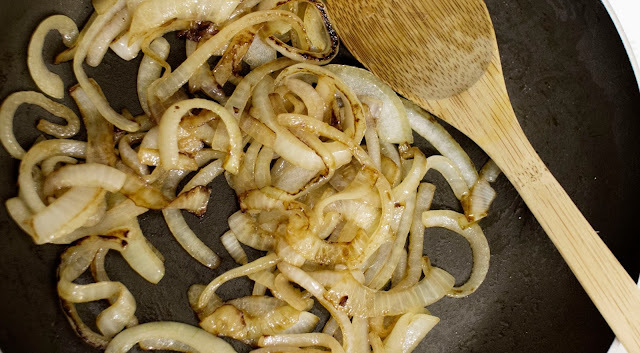 Cut your onion (or onions for smaller onions) into small slices. 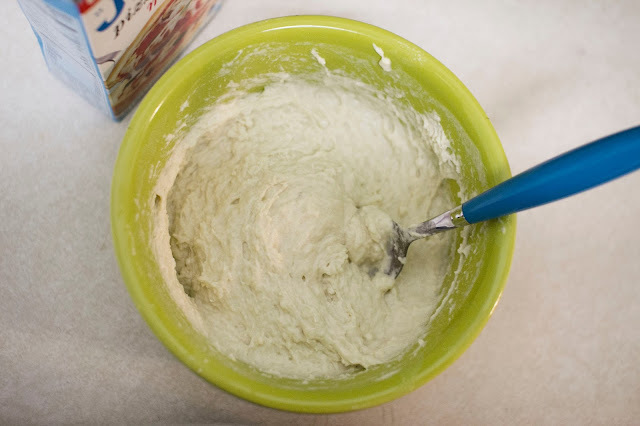 Melt 1 Tablespoon of butter in a skillet. 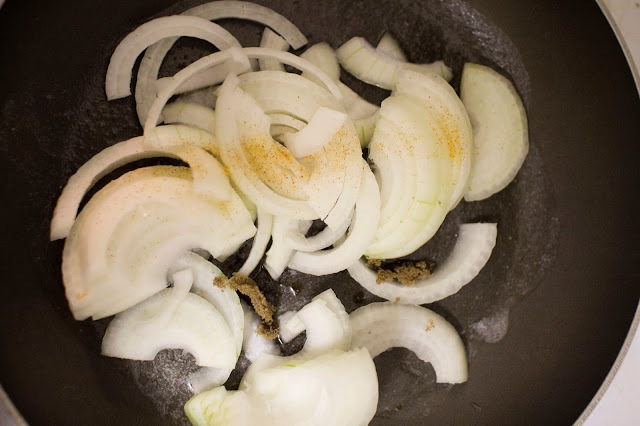 On a medium heat, put the onions into the butter and sprinkle with a small amount of seasoned salt and about a Tablespoon of brown sugar. Cook your onions until soft and translucent. 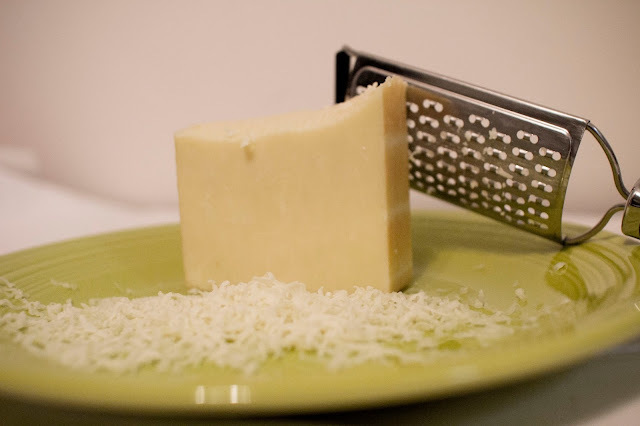 Be sure to shred any block cheeses. The smoked cheddar really made this one for us - I suggest you find a smokey cheddar and use bagged cheese for the Italian blend and Parmesan. Hopefully your bacon is done now! Turn the oven up to 425 degrees Fahrenheit to prep for the pizza. 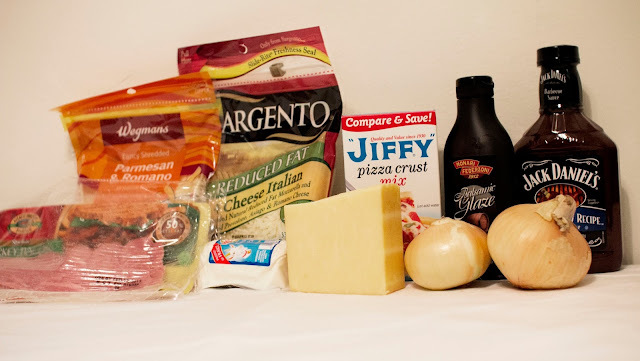 I love Jiffy pizza crust mix. I don't follow the instructions on the package as I like a thinner, crispier crust and this is how I get it. This is the only brand we buy and love - we actually can't find it in Pennsylvania and buy it in Ohio and bring it home. In a bowl, mix the box mix with 1/2 hot tap water. Stir well until mixed with minimal lumps. 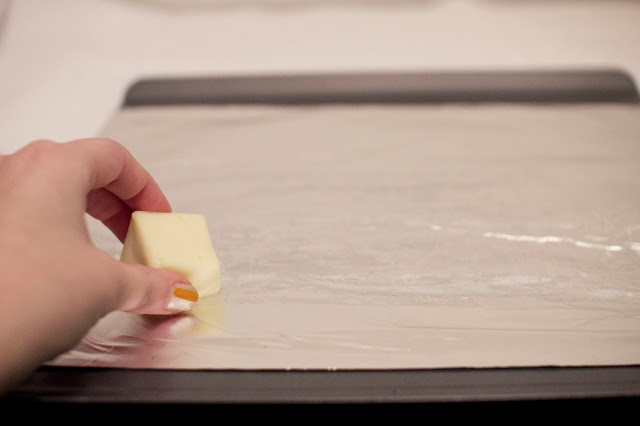 Immediately cut a slice of butter and grease a baking sheet generously. I line mine with foil for easy clean up. Then grease your hands with the butter, almost as if you are rubbing them with soap. The dough will stick terribly if you skip this. I have tried this with cooking oil, but butter works so much better as you can put on smaller, thinner layers, and you have a bit more control. 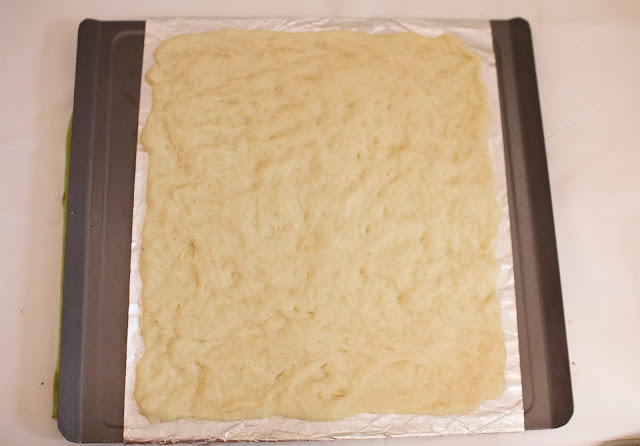 Begin to press out your dough from the center. It will form a fairly large square. 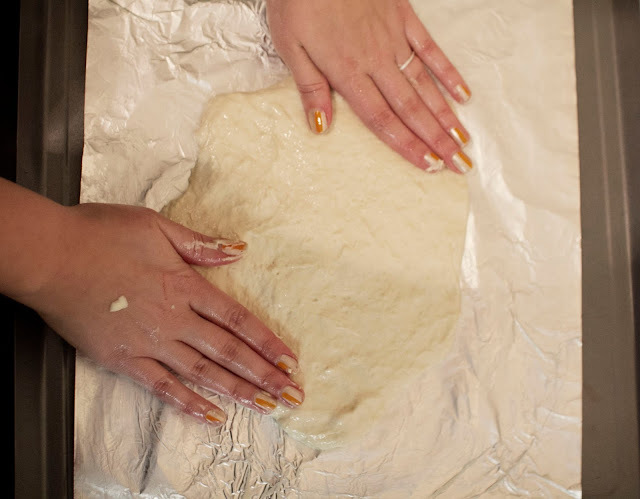 Be sure that your dough is fairly even with no thin or thick spots. 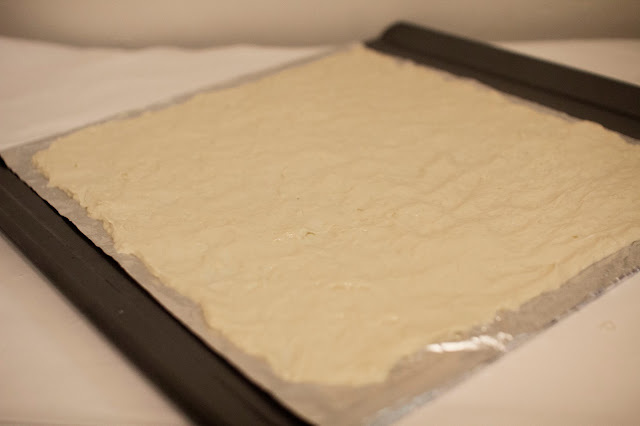 Place the dough in the oven (be sure you have turned it up from 375 to 425 degrees) and allow to cook for about three minutes. Your dough should now be tough, not doughy anymore, but not browned. Below is an example. 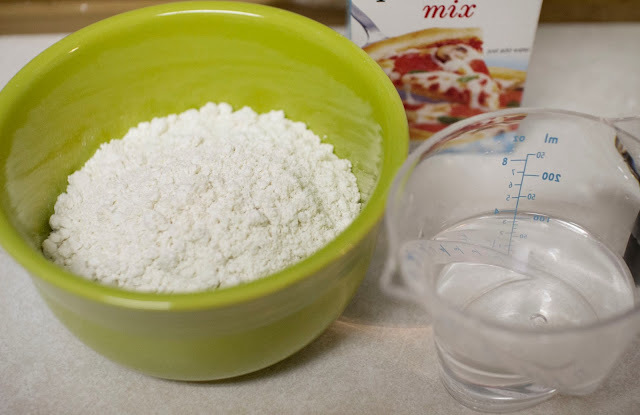 Spread about 6 or 7 Tablespoons of BBQ sauce (I use one to spread and measure by them because it seems silly to dirty a cup unnecessarily) onto the dough. It should be lightly covering the whole dough. 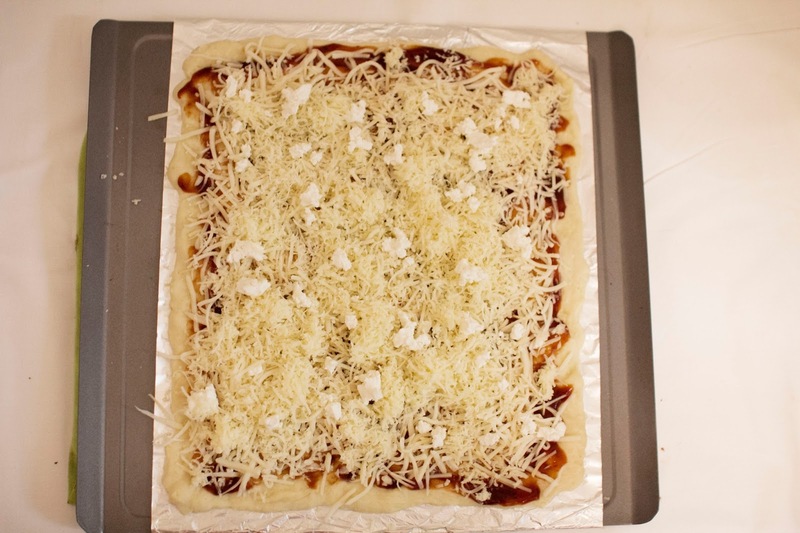 Begin to layer the cheese on. We layered cheese in the following order : smoked cheddar, Italian 5 cheese blend, Parmesan, more smoked cheddar, goat cheese. If you bought goat cheese in a log, be sure to crumble it with a fork. Wanna know the easiest way to cut turkey bacon? Do it with scissors! Scissors are an awesome kitchen tool that are often overlooked - my family uses them to cut frozen pizzas and other items. Why not? Anyhow I usually cut a few strips down, then cross them with smaller cuts to make little square bits as shown. 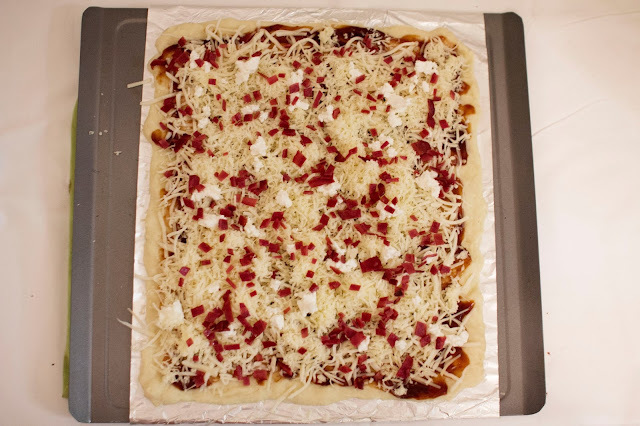 Sprinkle your cut turkey bacon over the pizza evenly next. Next comes the onions! Sprinkle them on evenly. 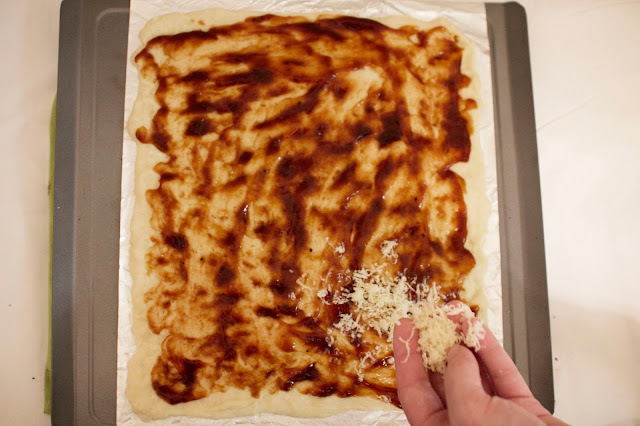 Then put the pizza in the oven again at 425 degrees and cook for 7-8 minutes or until the edges are browned. 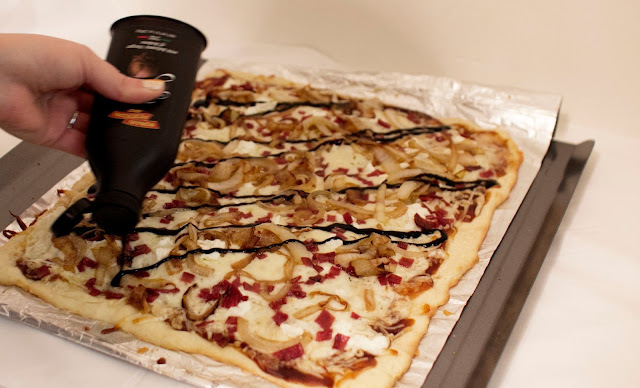 Once the pizza is out the oven, it's time to add the balsamic glaze on top. It is so good on this pizza! Drizzle is over - we make a cross hatch pattern. Now it's time to serve! Cut into squares and voila! Oh my! This looks so delish! that's looks really good and easy enough! you give the best instructions! YUM! That's how I feel now being unemployed, I just want to bake and cook all the time...weird feeling isn't it? gosh this looks so delicious!! I would love to try this one! i'm a vegetarian, but this would be delicious even without the bacon. yum!! YUM! 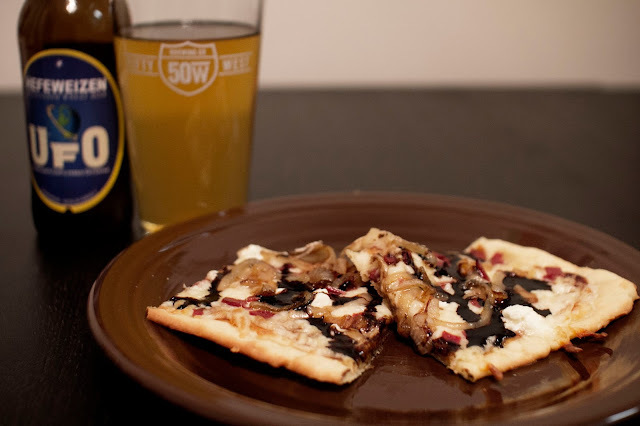 I love little flat bread pizzas! Oh my goodness this sounds good. Balsamic glaze? What is this? It sounds fascinating. Andy and I have balsamic vinegar and olive oil on bread or pasta or salad all the time. This may be a thing we need for our kitchen! The pizza bread certainly looks delicious, especially with the goats cheese. mmm. Also - I am with you on the scissors! I use them for the exact same things, cutting pizza, cutting bacon etc. So useful. Replacing chicken with bacon? This is my kind of dish!! I'm pretty sure this is out of my cooking skill level (it's a pretty low, pathetic level), but it looks delicious! well these are all of my favorite things in one sooo.... i think ill NEED to give it a try. this pizza looks so delicious !!!!!!!!!!! Ohhh boy this looks so good!! This looks delicious. Needs to meet my belly ASAP! we loooove making pizza! 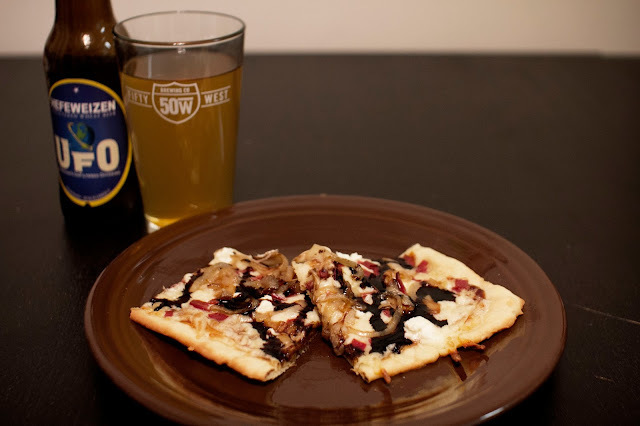 out fave is truffle oil and goat cheese. NOWM. Yummmmm! 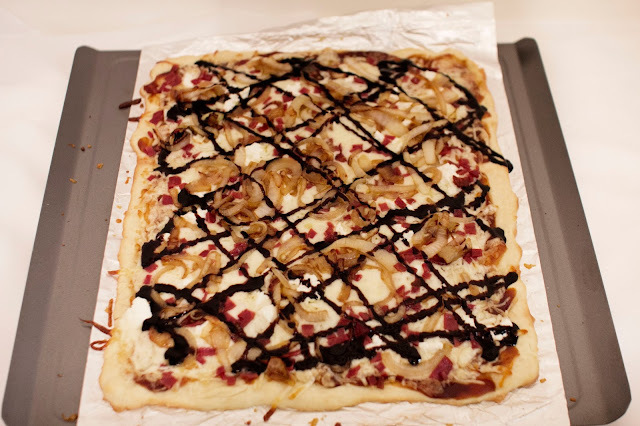 The balsamic glaze looks like the perfect topper to this pizza. I think I need to make this.